Neal Gottlieb launched Three Twins Ice Cream in 2005, and has since expanded his business from a single scoop shop to a national brand sold in over 3,000 locations across the United States. Though he started the California-based company with no ice cream production experience, Gottlieb’s goal has always been to build Three Twins into the next great American ice cream brand, offering reasonably priced, inconceivably delicious organic ice cream. He started slowly and humbly, opening a scoop shop in a hard-to-find storefront in San Rafael, California, using his life savings and a loan from The Bank of Mom and Dad. For months, Gottlieb was the company’s only employee – he made ice cream, sold ice cream, cleaned equipment and addressed paperwork all on his own. Eventually, thanks to blind ambition and 90-ˇhour workweeks, he started making progress. Though first-year sales were slim, Gottlieb managed to pay himself $4,000 – that equated to about $1 per hour – and somehow showed a small profit. Realizing that he couldn’t make a sustainable living with one shop, he began selling at farmers’ markets and to restaurants, and then sold hand-packed pints to local groceries. Business soon took off. Today, Three Twins operates five Northern California scoop shops, a kiosk at San Francisco International Airport, and an ever-ˇexpanding wholesale business. Giving back has been a priority for Gottlieb since Three Twins’ opening week, when a post-Hurricane Katrina benefit in the San Rafael scoop shop raised $1,300. 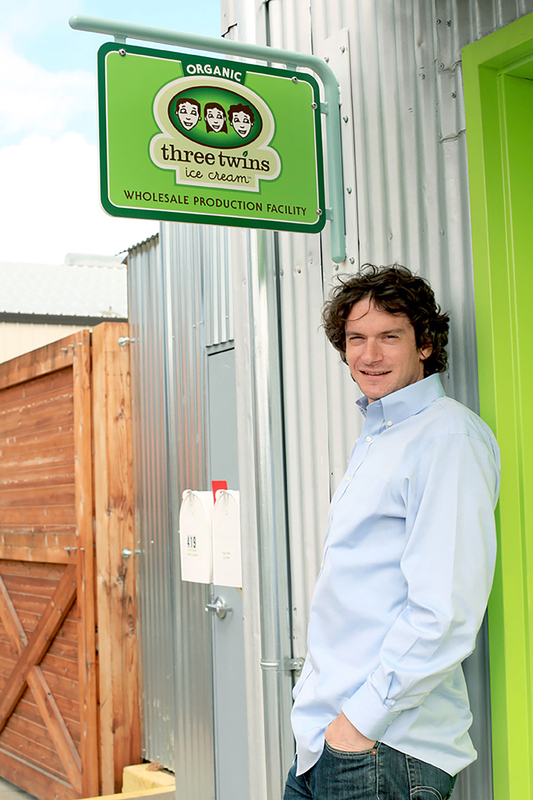 The company became a proud 1% for the Planet member just months later, and today Three Twins donates one percent of sales to organizations such as the Marin Agricultural Land Trust (MALT), Marin Organic, Sonoma Land Trust and Land Trust of Napa County, plus other land trusts and environmental non-ˇprofits. In conjunction with the company’s membership in 1% For The Planet, Gottlieb also launched Three Twins’ Ice Cream For Acres land conservation initiative in 2011 to build a direct conservation model into its products. With the purchase of each pint of Three Twins Ice Cream, the company funds the protection of at least six square feet of land – including habitats that house threatened wildlife, and other rare environments around the globe. Gottlieb’s proudest achievements, in addition to starting Three Twins Ice Cream, include summiting Mount Kilimanjaro (and churning ice cream with ice harvested from the glacier closest to the summit), being named the 2011 American Airlines “Road Warrior” Contest winner and earning Entrepreneur of the Year recognition from San Francisco’s Renaissance Entrepreneurship Center. In 2014, Gottlieb scaled Uganda’s highest summit, mounting a gay pride flag on the country’s highest peak in protest of the outrageous anti-homosexuality laws-his actions made worldwide headlines. Three Twins has also been recognized by Inc.
Magazine’s annual 5000 awards as one of the fastest growing businesses for 2013 and 2014. Prior to founding Three Twins, he served as a Peace Corps volunteer in Morocco and worked in the corporate offices of Gap and Levi Strauss. Gottlieb graduated from Cornell University’s College of Human Ecology with a bachelor’s degree in consumer economics and housing. When not traveling for work, he enjoys traveling for fun, hiking, watching baseball, spending time with his nieces, and plotting and scheming. Gottlieb lives aboard a small houseboat berthed in Sausalito, California.